Immunogen Full length human recombinant protein of human PCNA (NP_002583) produced in E.coli. Background The protein encoded by this gene is found in the nucleus and is a cofactor of DNA polymerase delta. The encoded protein acts as a homotrimer and helps increase the processivity of leading strand synthesis during DNA replication. In response to DNA damage, this protein is ubiquitinated and is involved in the RAD6-dependent DNA repair pathway. Two transcript variants encoding the same protein have been found for this gene. Pseudogenes of this gene have been described on chromosome 4 and on the X chromosome. [provided by RefSeq, Jul 2008]. HEK293T cells were transfected with the pCMV6-ENTRY control (Left lane) or pCMV6-ENTRY PCNA (RC201741, Right lane) cDNA for 48 hrs and lysed. Equivalent amounts of cell lysates (5 ug per lane) were separated by SDS-PAGE and immunoblotted with anti-PCNA. 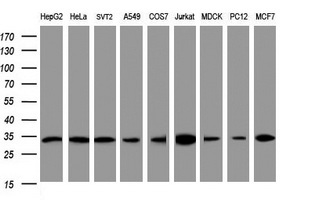 Western blot analysis of extracts (35ug) from 9 different cell lines by using anti-PCNA monoclonal antibody (HepG2: human; HeLa: human; SVT2: mouse; A549: human; COS7: monkey; Jurkat: human; MDCK: canine; PC12: rat; MCF7: human). Immunofluorescent staining of HeLa cells using anti-PCNA mouse monoclonal antibody (TA800875, green, 1:50). Actin filaments were labeled with Alexa Fluor 594 Phalloidin (red), and nuclear with DAPI (blue).